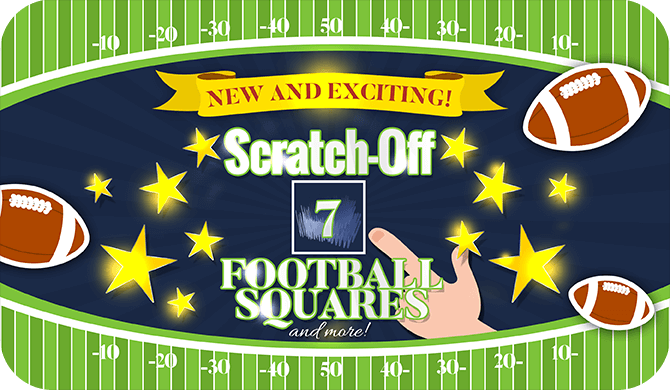 Our unique Square Grid Scratch-offs are pre-loaded with randomized numbers, then concealed with a high quality scratch-off material. We currently have six versions available. 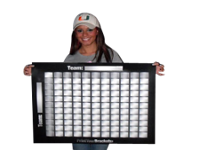 Our products include the 100 Square Grid, the 50 Square Grid, and the 25 Square Grid, along with the 100 Square Grid with Quarter lines and the 100 Square Grid with Halftime Lines, all of which are 9 x 11.5" in size. These are the square grids that you have more than likely seen used during the Super Bowl. Our other product is the 3" x 6" 10 Line Scratch Cards, which allow for a quick, easy pool for 10 participants or less. Our products are for entertainment purposes only! Check out how to use our boards for fundraisers, sales competitions, and in bars/restaurants. The 10 Line Scratch Cards are perfect for a quick pool with 10 participants or less. 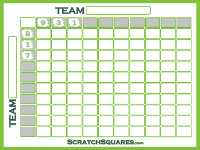 Fill the 10 Lines with participant's names and remove the scratch off material to reveal the numbers 0-9. These cards can be used for Football, Basketball, Baseball, Hockey and even UFC, Nascar, Golf and Boxing. Impress your guests with this 24" x 32" high resolution Square Grid Office Pool. This grid is perfect for your Super Bowl Bash or to use at your weekly football party! These are available in 100, 50, and 25 square versions. *This product is not a Scratch-Off.